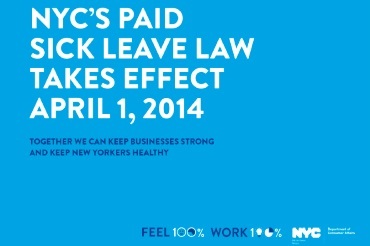 The city’s new paid sick leave law is in effect as of April 1, 2014. Business owners, learn the law and how to comply. Who Must Provide Sick Leave? Employers with five or more (5 or more) employees who work more than 80 hours per calendar year in New York City must provide paid sick leave. Who’s Covered by the Law? Employees who work more than 80 hours a calendar year in New York City are covered by the paid sick leave law and accrue one hour of sick leave for every 30 hours worked, up to 40 hours in a calendar year. If their employer has five or more employees, they have the right to paid sick leave, and if the employer has fewer than five employees, they have the right to unpaid sick leave. The law covers full-time and part-time employees, transitional jobs program employees, undocumented employees, employees who are family members but not owners, and employees who live outside of New York City but work in the city. Covered domestic workers have the right to two days of paid sick leave after one year on the job, which is in addition to the three days of paid rest under New York State Labor Law. Employees can use sick leave to care for themselves or a family member. Family members include child, grandchild, spouse, domestic partner, parent, grandparent, child or parent of a spouse or domestic partner, or sibling (including half, adopted, or step sibling). View the entire presentation on the Paid Sick Leave Law from the Department of Consumer Affairs here. Previous post: Do You Deliver? Next post: Borja Law Firm, P.C.